2010 marks the 20th anniversary of ‘The Field’. 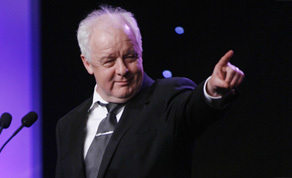 In the year of Italia ’90, the launch of the Hubble Space telescope and Nelson Mandela’s release from jail Jim Sheridan helmed the film which was an exploration of the quintessentially Irish cause for dispute – land. Twenty years down the line IFTN spoke with the director about the project; his memories of making it, what he thinks of it now and the effect it has had his career choices since then. For the unfortunate few who’ve not seen this Irish classic, ‘Bull’ McCabe's family has farmed a field for generations, sacrificing incessantly for the sake of the land. And when the widow who owns the field decides to sell it in a public auction, McCabe is adamant that he owns it. No one in the village will dare bid against him, but an American with deep pockets decides that he needs the field to build a highway. Richard Harris (Unforgiven) came on board as ‘the Bull’ alongside a then-unknown Sean Bean (Troy) who took on the role of Bull’s son, Tadgh McCabe and the pair were further joined by actors Frances Tomelty (Cheri), John Hurt (Alien), Brenda Fricker (My Left Foot), Sean McGinley (Man About Dog), Brendan Gleeson (Into the Storm) and Tom Berenger (Inception). Lead actors duly rearranged production started to get underway. ‘The Field’ came straight after the runaway success that was ‘My Left Foot’, a partnership between Jim and producer Noel Pearson (Tara Road). The pair united their respective talents once again for ‘The Field’ but the creative partnership altered greatly with the coinciding executive role Noel had in Dublin’s Abbey theatre. “On ‘My Left Foot’ it was very close,” Jim tells us, “it was Noel’s idea and he was very involved. With ‘The Field’, he was there at the beginning but as we went on he was more involved with running the Abbey but still involved and available to talk about the film.” They haven’t worked together since. A question about working with Richard Harris brings an animated, albeit unexpected reaction: “Me and Harris fought nearly every single day!” He recalls, without a moment’s hesitation. ”Over everything; where he stood, the script . . . I will never forget Harris, he was mad to work with.” As if to back up this point a bizarre anecdote follows suit: “One day I was fighting with him because I wanted him to do a retake on the scene in the river and he ran up a hill. People came with coffee and towels, and first the coffee went flying in the air and then the towels went so I ran up the hill after him.” What follows is the description of a cat and mouse game of the two men running around each other in a bid for advantageous height before calling it quits and returning to flat land for the rest of the shoot. And, despite the glittering variety of international stars he has worked with, it is a home-grown individual who Jim is eager to work with again. “I would still love to do something with Daniel Day-Lewis, if we could find the story. I think me and Daniel were great together.” A beat. “Or maybe I was great with Daniel Day-Lewis.” Asked about the atmosphere on set when working with the Oscar winner, Jim paints an exhaustively passionate picture describing it as one of the most intense relationships he has had.